FNS provided training to States to help them improve and strengthen their SNAP E&T programs. During the two-day meeting, FNS provided training to States to help them improve and strengthen their SNAP E&T programs. The State Institute model combines collaboration and team planning with training workshops that enable States to share best practices and learn from subject-matter experts. Workshop sessions focused on how to design a SNAP E&T program that provides appropriate training opportunities to SNAP participants so they can find in-demand jobs with skills that employers need – a win-win proposition. 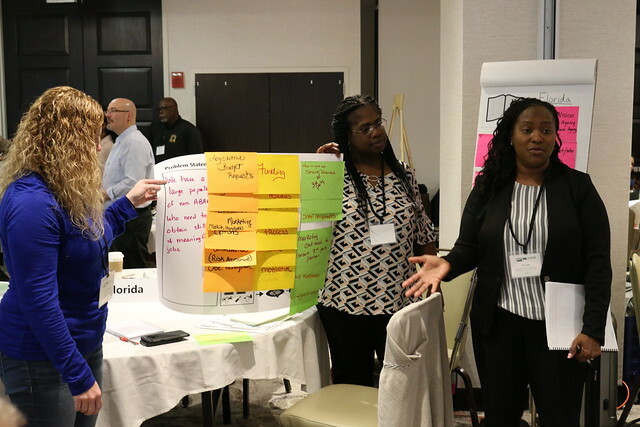 Participants from state SNAP and workforce agencies were actively engaged in learning and advancing the goal of improving the lives of those they serve and the communities where they live. The energy and focus was inspiring! These Institutes are part of FNS’s ongoing efforts to help states create education and skills training programs for SNAP participants that will help them move toward self-sufficiency. FNS is committed to providing the resources states need to build high quality programs, and the proactive customer service to implement them successfully. To put it in real terms, the State Institutes are part of a robust, multi-year strategy, including training, technical assistance, grants, and innovative demonstration projects, to prepare SNAP participants for meaningful work opportunities that meet the demands of our fast-paced, dynamic economy. Building a SNAP E&T program that meets the needs of both SNAP participants and employers is important work. Through the State Institutes, FNS is providing States the opportunity to share best practices, identify effective strategies, and develop a road map for growing their programs – building success on success. I saw first-hand that our state partners are clearly dedicated and committed to this effort and the ultimate goal of helping SNAP participants achieve self-sufficiency and enjoy the dignity of work. FNS will continue to design innovative technical assistance and collaboration strategies to ensure states they have the tools and resources they need to develop high-quality programs informed by FNS’s – and, just as importantly, each other’s – experiences in planning, implementing, and growing a SNAP E&T program.